The River Leach is a urban dweller’s rural dream, Quiet, beautiful and quirky, it meanders into the joint Gloucestershire parishes Eastleach Turville and Eastleach Martin (now Eastleach) , passes deferentially between two proud Norman churches, drifts through a little flagstone bridge and ambles on its way, disappearing underground occasionally, then reappearing without warning or change of pace. A kingfisher lives on its banks, they say. And herons and a buzzard family. An inquisitive fish breaks its surface occasionally, but for 364 days in the year that is about the apex of the excitement. On the 365th day, however, Whit Sunday (as the traditionally minded people of Eastleach still call the spring bank holiday). Bucolic calm is blasted. Birds and fish take over, as men, women and children of previous sound mind and reasonably blameless character plunge into its chilly waters to take part in a wild, aquatic tug of war. A reasonable enough explanation and clearly the best I was going to get. The Frolics may not be mentioned in the Doomsday Book – the village is – but they have been going on, longer than anyone can remember. They may have an aspect outsiders find bizarre, but that is true of all the best traditions. Monday’s festivities began with a football match, Marrieds v Singles in the field behind the village hall. That sounded orthodox enough. When they have been playing for 20 minutes, however, I suddenly realised that the Married had fielded 10 men and one Woman – Janet Young, a poet in the Pam Ayres tradition, bar maid at the 500 year old Victoria and the wife of Richard Young, a local farm manager. At halftime Janet told me: “I said they’d get no booze tonight if they didn’t let me play. That sort of settled it’” In the second half she would have scored, if her borrowed boots hadn’t been three sizes too big. Traditionally the Vic, Eastleach’s only pub, is Frolic headquarters. After the Marrieds had beaten the Singles, we all adjourned there for post-mortems and the recharging of batteries, Philip Watt the Frolics organiser, was finding strength in a bottle of Newcastle Brown. He needed it. At five that morning he had been spraying weeds on Macaroni Downs Farm where he works. The he dashed over to launch the Frolics. Then he played for the Marrieds. It would be nearly midnight before his day could end and early next morning he was off to Florida with his family. We trooped back to the football field for the races; forward races, backward races, sack and three legged races combined with a lethal obstacle race and egg and spoon races which produced a variety of enterprising skulduggeries, particularly among the under-sixes. 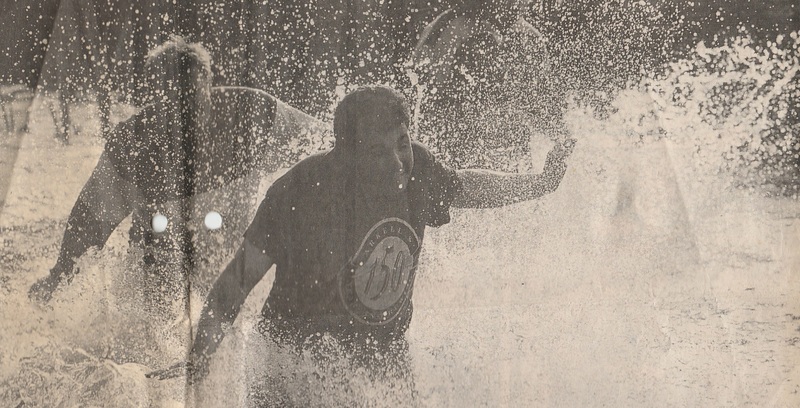 Nobody seemed to notice the showers which at times were heavy enough to drive holes in our heads. By 4.30pm we were back at the pub for the money and sweets scramble on its grassy slopes. No rules here and no quarter given, Philip flung money and sweets aloft. The children scrambled. Then it was time for the Treacle Snap, a particularly revered Frolic tradition. A rope is flung over a sycamore branch outside the pub. A loaf, soaked in treacle, is tied to it. 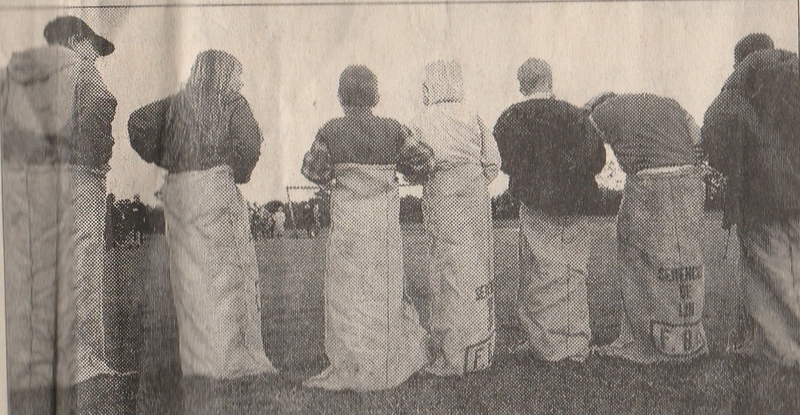 Children taking part are enveloped in fertilizer bags which pinion their arms, but leave their heads free. The battle begins. The loaf is kept bobbing and weaving by someone pulling the rope. The children leap for it, heading it until most of the treacle has transferred to their hair, their faces and fertiliser bags. The winner? The one who collects most treacle. Then she sat on the ancient stone wall in front of the Vic and took part in the ladies’ Balloon race, invented by some early Eastleachian sadist. Competitors have to drink a plastic cup of lemonade, eat a large cream cracker and blow up a balloon until it bursts. She win at a canter. 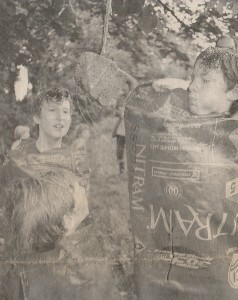 The tug-of-war was fast approaching, but first we had the Duck Race. For 48 hours Mark Jennings, proprietor of the Vic, had kept more than 350 numbered yellow, plastic ducks in his cellar, presumably to prevent nobbling. Just before the race they were ferried by tractor to the bridge that links the two churches. Punters has bought tickets, stamped with a duck number: if yours on, you collected £100. There was even a booby prize for the owner of the last duck – the most Stuck Duck, they called it. The tractor driver decanted them into the river. Downstream they wobbled, a plastic armada huddling together until class began to tell. Number 261 stretched himself and moved clear to win by six lengths. I looked at my ticket. I had duck number 260 which sounded close, but I wasn’t even the most Stuck Duck. The winner was John Watt, father of Philip, the organiser, “Fix!” they cried. The tug-of-war, flagship of the Frolic, brought the village to the banks of the Leach. The rope was stretched beneath the flagstone Keble Bridge – so called because the Rev Dr Keble, who later had an Oxford College named after him, preached his first sermon in Eastleach. The teams plunged in and a quick count revealed 16 on one side and 23 on the other, an imbalance that upset nobody. An obvious weight difference, however, brought protests. The 16 were Leviathans, weighing several tons. The 23 were minnows, a few male adults and the rest women and children. It was too late for redistribution, in round one the leviathans heaved and the minnows slithered predictably to swift defeat. Massacre. In round two, however, the underdogs struck first and submerged the tubby enemy in a welter of flailing arms and legs. Demoralisation followed. The minnows won the decider – and suddenly I spotted their secret powerhouse. Still holding the rope down there were Peter Hinton, six year old hero of the Treacle Snap, and his mother Sarah, winner of the Ladies’ Balloon race. She had told me he would wash the treacle off in the river and she was right. Champagne was served to the teams in the river. Then back they went to the Vic, sodden ones and dry ones alike, to find Jane Young, now changed out of her soccer strip into fetching frock pulling pints as promised, The pub was packed and the happiest man was probably Phil Watt, the organiser, relaxing for the first time since he went weed spraying at five o’clock that morning. Everyone said Frolic 95 had been a success – and he thought so, too. That was when I realised it was more it was more than a one day wonder. It was part of Eastleach’s heritage and it had a message for the future, too. For years outsiders had been prophesising doom for the village. Its school had closed, they said because there were not enough children. Its one shop has closed because there was no trade. Its cricket and football teams had disbanded because there weren’t enough players. Eastleach, they said, would die because there was no room for old-fashioned villages in a hypermarket world. The locals said nothing, but knew the doom watchers were wrong. The past two decades had been tough, certainly, but 20 years is not a long in the life of a village…….. And they knew the pendulum would swing because it always ad. Meanwhile, they kept alive their seemingly anachronistic fetes and Frolics because they saw them as symbols of Eastleach’s vitality. Now that faith is being justified. The number of children in the village is rising slowly. The number of families finding homes there is increasing gradually, too. There are plans to revive the football and cricket clubs. The pendulum is swinging and Eastleachians know it. Sanding in the fading sunshine outside the Vic, I asked them how long the Frolic could last in the electronic age. “Forever” they said happily, and I wouldn’t argue with that. Pity about that duck, though. Article kindly donated by Jane Dewey & Anne Leeming, 44 Eastleach ( The Clock Tower Cottage ). For more recent images of the Frolics, click here. Eastleach has many other events during the year, find out more here.